Whether you’re on a first date, job interview or sending your very first email, these impressions are long-lasting. So when someone subscribes to your newsletter you get a one-time chance to make a cracking first impression. This is your time to shine and the best way to do it is to send an awesome welcome email. Why are welcome emails so important? Well, it’s not just about making a good first impression but they’re also important because welcome emails tend to have a higher open rate compared to other types of emails. 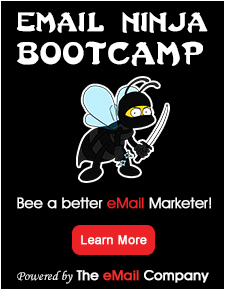 Which means this really is an email marketing opportunity not to be missed! Here are 3 tactics that top notch welcome emails use (with a couple of bonus tips along the way). If you’ve collected details about your subscriber in the signup process, use them! 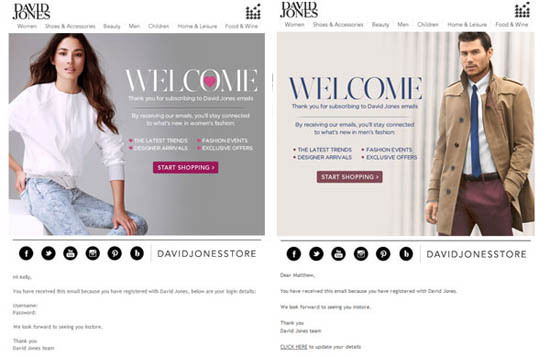 David Jones personalises their emails with first names, gender and shopping interests. Here’s an example of the welcome email I received as a female interested in fashion versus one my colleague, who is interested in menswear, received. Bonus tip: David Jones make good use of their pre-header text by asking subscribers to add them to their address book. Pre-header text is often wasted on ‘view online’ or ‘unsubscribe’ links. It’s refreshing to see it being used to help make sure their emails don’t end up in junk boxes. Another good tactic used in this campaign is the Call-to-Action ‘start shopping’, to drive customers back to the website to make a purchase. 2. Reward your new subscribers. Using an incentive is an effective tactic to help get people to subscribe to your newsletter. But do you know what I personally love? An unexpected reward for signing up. 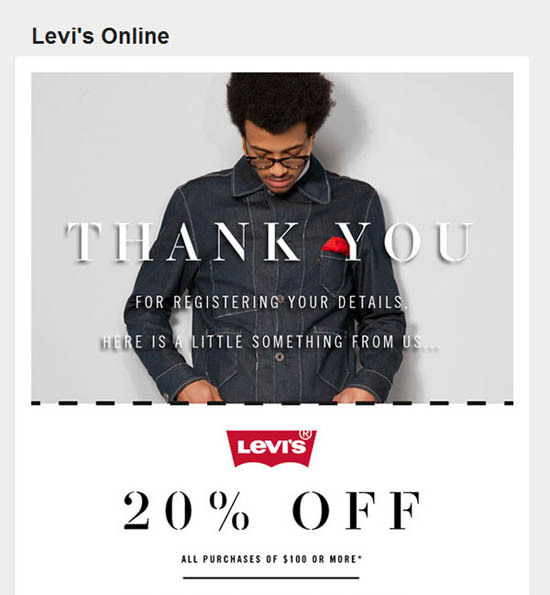 I got such a pleasant surprise when I received this email from Levis. Bonus Tip: Don’t forget to use your manners! Specifically thank the new subscriber; it’s a big deal that they’ve invited you into their inbox. Let your subscribers know what sort of stuff you’ll be sending and how often you’ll email them. 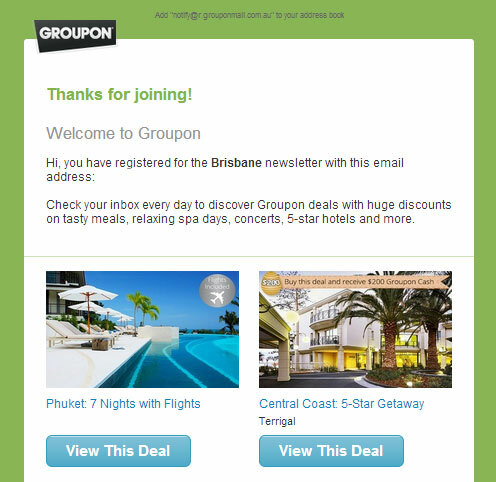 Groupon does this particularly well, because not only do they let you know how frequently they’ll email you (daily) and exactly what you’ve signed up for (Brisbane newsletter), but they also give you a sample of what you’ll receive. Expectations are clearly set and later delivered upon. 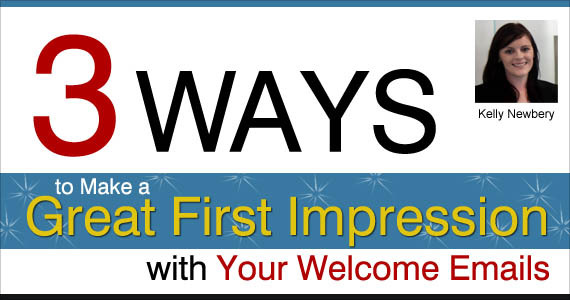 Takeaway: You only get one chance to make a great first impression; don’t waste this precious opportunity. Create your own welcome email. It’s easy to create a welcome email in Vision6 . And the best thing is, you can automate the process, so once it’s set up you don’t need to manually send the emails. I’d love to know if you have any other tips for creating welcome emails that engage customers? Share any comments below. Profile: Kelly Newbery is the Marketing Specialist at Australian email marketing software company Vision6 where she contributes regularly to the Vision6 blog. She is passionate about e-messaging and actively works to inform, educate and promote all things email marketing to both clients and non-clients.